Remote Technical Support | GPX Global Systems Inc. 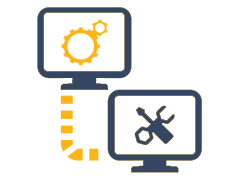 Through GPX’s Remote Hands Support (RHS), customers can engage experienced, on-site technical personnel to provide basic assistance with platform or equipment problems. GPX RHS offering can be the client’s eyes and ears onsite, performing basic server or communications equipment reboots, identification of fault conditions via equipment inspection, testing of cables or connectors, or the swapping of FRU (Field Replaceable Units) under the guidance and direction of the customers NOC. These services can be instrumental in proving rapid response, backup, or support during off-shift hours, for a fraction of the cost that it would take to send customer personnel.